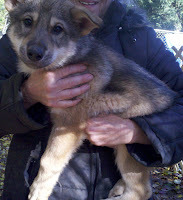 Preparing for your new wolf hybrid puppy can seem daunting, but it really isn't. You just have to figure out what to get in your back yard and what to get out of your back yard, before the wolf pup arrives. When you receive your new wolf dog from our Wolf Hybrid Ranch, your puppy comes with his or her registration papers for the Continental Kennel Club (CKC), a stuffed toy with the scent of its litter-mates and mother, a bag of food which it has been accustomed to begin to mix its new food. Your puppy will have a shot (vaccination) history packet with all of the wolf dog's information. Additionally, we provide a collar and leash for your wolf dog. Mark Hash, the Wolf Dog Ranch Facilities Manager, prepared an easy to follow, step-by-step with pictures tutorial on How To Build A Wolf Den From Scratch. Check out the plans here. The cost of the supplies is about $50 at our local lumber yard. Wolf Dog Ranch Trainer Seth Marin starts you with a good look at the balance between love and discipline when handling your wolf hybrid. Read Seth's Article "The Balance of Love and Discipline" - it doesn't cost you a cent. Wolf Dog Ranch Breeder Edye Marin has prepared two articles for you to read before you receive your new wolf dog. Read Edye's articles "You Are the TOP DOG - letting your wolf dog know you're alpha" and "When You Get Your New Wolf Dog Home" - they are both FREE! Before you own a wolf dog, double check your state laws. Here is a list of the state laws - this list is also FREE! Before your wolf dog puppy can fly on an airplane or travel by other public means, your pup will need to visit the vet for a check up. The veterinary office visit is $50. For Example: Bellingham, WA; Palm Springs, CA; Boise, ID; Sacramento, CA; Las Vegas, NV; even Superior, Montana and Salt Lake City, Utah are all within the shipping radius to have someone from our Wolf Dog Ranch personally deliver your puppy. The piece of mind, alone, may be worth more than $250. Visit Google Maps to find out if you are within 800 miles of Etna. I have found my best results are scheduling a flight on either Delta or Continental. We can ship your puppy via Delta Airline out of Medford, Ore. (MFR) or Continental out of Sacramento, Calif. (SMF). In addition to the airplane ticket, we ask that you cover our personal delivery fee ($250) to transport your puppy personally to the airport.